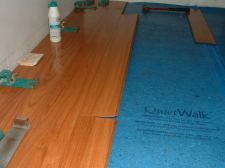 This Vanier laminate flooring review is based on me installing it. This product is 12mm thick (1/2 inch) almost 5 inches wide and almost 48 inches in length. All four edges are slightly beveled. 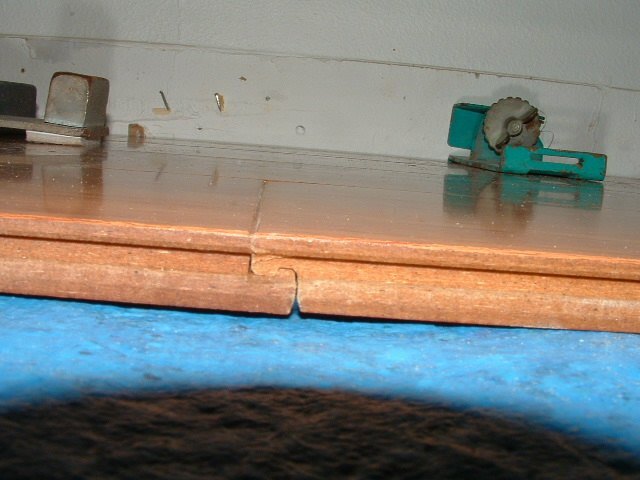 The AC 3 rating makes this a very durable floor. The finish is what is called a piano finish because of the high gloss shine. If you do find this laminate somewhere I recommend it. The locking system is what I call "drop and lock". You can't connect the planks laying flat on the floor. They have to be tilted in order to engage together. Once the side is locked and you drop it down the end joints are automatically engaged. Here in this photo I have connected the side joint. It is still up at an angle before I will push it flat to the floor. In this photo you can see the end joint and how it will engage when it is dropped down. When I installed this flooring I didn't need any tools to connect the planks together. 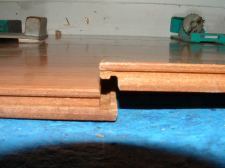 Normally with other locking systems the planks need to be tapped together in one way or another. Here the joint is locked together as it is pushed down. The next row will span this joint and it will not come apart. I enjoyed working with this flooring. You would think that the high gloss finish might show scratches, I actually used 150 grit sand paper on a scrap just to see how tough the finish is. I could hardly tell where I sanded. 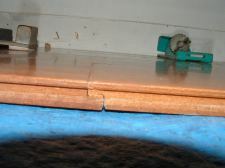 The core material is very strong and was hard to damage. The locking system can make it a little difficult to install when installing up to door jambs. I had to shave off part of the locking system in some cases and use glue to hold the planks together. The thickness of this product makes the locking system thicker which makes it easier to shave and glue the joints. Over all I would strongly recommend this Vanier laminate flooring to anyone who wants a quality flooring at a very competitive price.